Well you may have heard I, Dr. Gumbiner, and my family are expecting a bundle of joy at the end of this month. I thought it would be appropriate to write about conditions I see in newborn babies. 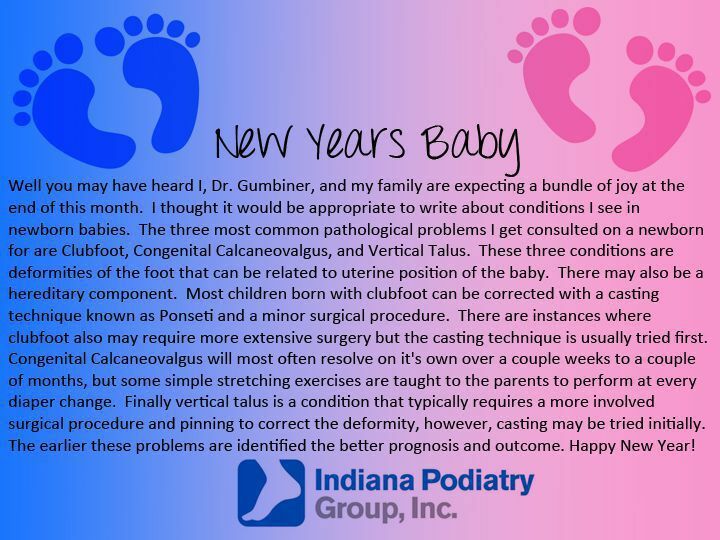 The three most common pathological problems I get consulted on a newborn for are Clubfoot, Congenital Calcaneovalgus, and Vertical Talus. These three conditions are deformities of the foot that can be related to uterine position of the baby. There may also be a hereditary component. Most children born with clubfoot can be corrected with a casting technique known as Ponseti and a minor surgical procedure. There are instances where clubfoot also may require more extensive surgery but the casting technique is usually tried first. Congenital Calcaneovalgus will most often resolve on its own over a couple weeks to a couple of months, but some simple stretching exercises are taught to the parents to perform at every diaper change. Finally, vertical talus is a condition that typically requires a more involved surgical procedure and pinning to correct the deformity, however, casting may be tried initially. The earlier these problems are identified the better prognosis and outcome. Happy New Year!